The SnappyCam Pro iPhone and iPod Touch app rapidly shoots photos, lets you quickly ditch the undesirable ones, and shares to Instagram easily. The two features that elevate this photography iOS app are the surprising speed of taking multiple photos with one touch and the customized, advanced lens features. 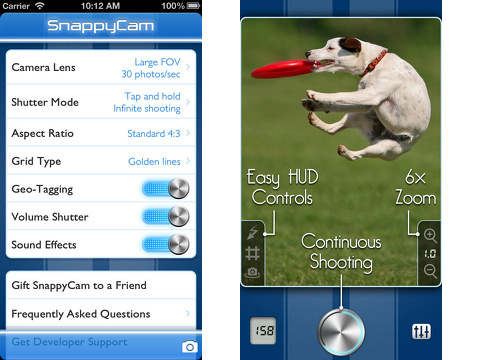 The SnappyCam Pro iPhone app has a quick introduction to its features, as you start using its tools and features. An authorization to permit location services automatically tags your photos with location. You can touch the lens to manually focus your lens, or you can double tap for auto focus. In the right corner, you can magnify and expand the shot with incremental taps. With a touch in the left corner, you can add a grid, flash, and switch to selfie mode. You can touch the button to simply shoot one photo. Or, you can hold the button for rapid fire shooting. You will not miss that perfect moment of your child diving from the podium into the water–instead of capturing just the feet entering the water. Snappy Cam Pro iPhone app settings may be adjusted by touching the lined icon in the lower right corner of the in-app camera screen. You can adjust the field of view of the in-app camera’s lens with volume bar adjustments manipulated with finger drags. You can choose between tap and hold or toggle shutter modes. You can select from six aspect ratios. There are eight grid styles to help you properly align your subject. You can also turn off the snapping sound that is created with each tap on the shoot icon. The sound adds dimension to your photography experience, but it does limit your ability to capture photos without being noticed. After you take photos, you can check out your camera roll. An interesting detail is the size of the image, so you can manage your data storage easily. In the camera roll, you can swipe horizontally or tap the arrows at the bottom of the screen to check out groups of your shots. When you shoot in rapid succession, the photos are grouped together for you to edit out the duds and keep the successful shots. To examine and eliminate photos, you use a combination of gesture controls. For each group of photos, you can scroll through the selections with vertical swipes on the camera roll-style graphic in right corner or tap on the arrows at the bottom of the screen. You press the arrow icon in upper right hand corner to trim. You use vertical swipes to eliminate the unwanted photos on the camera roll graphic, but, unfortunately, the gestures are not as responsive and accurate as expected. When you swipe your finger and release it, there is a lag time that makes it possible to eliminate shots you may not have intended. I recommend using the delete icon to eliminate unwanted shots. 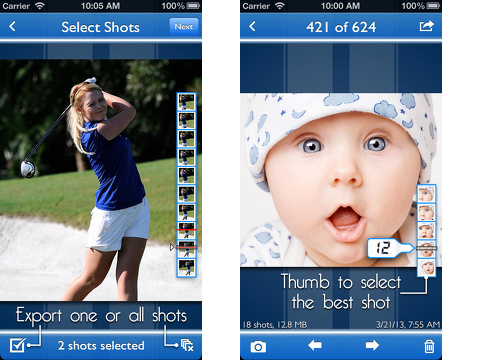 The delete icon gives you three choices–all of it, only this shot, or all other shots. You save the ones you cherish and ditch the ones to preserve data space. You can export to email, save to album, or share to Instagram. To save to your iPhone library, you tap a check mark to select it and press the save icon in the upper right corner to complete the saving process. It is a great photography iOS app for the masses, but the customization features make it appealing to a more sophisticated user. With the SnappyCam Pro iPhone app, you can snap that perfect action shot and will never miss a precious moment. AppSafari review of SnappyCam Pro – Fast Camera for Amazing High Speed Burst Action Living Photos was written by Jenni Ward on August 8th, 2013 and categorized under App Store, Kids, Photos, Sports, Utilities. Page viewed 5121 times, 3 so far today. Need help on using these apps? Please read the Help Page.